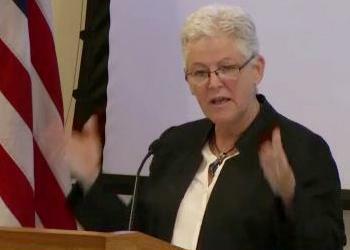 CAMBRIDGE, Massachusetts, July 31, 2013 (ENS) – Newly confirmed Environmental Protection Agency Administrator Gina McCarthy on Tuesday pledged action on climate change during the Obama administration’s remaining years, saying the concern is as much economic as it is environmental. “Climate change will not be resolved overnight, but it will be engaged over the next three years; that I can promise you,” McCarthy said during her speech at Harvard Law School. McCarthy, confirmed to head the federal agency on July 19 after a bruising Senate review process, decried what she called a “false choice” between environmental health and economic health presented by those who oppose regulation. She pointed to the U.S. economy’s growth over the decades since landmark environmental regulations were passed in the early 1970s, and held up clean air and brownfield cleanup programs, both administered by the EPA, as examples. Between 1970 and 2011, air pollution emissions fell 68 percent in this country, even as the gross domestic product rose 212 percent and the population increased 52 percent. In addition, Clean Air Act programs prevented 205,000 premature deaths and 18 million childhood respiratory illnesses between 1970 and 1990, she said. Total private-sector jobs increased 88 percent. Overall, she said, every dollar invested under the Clean Air Act has borne $30 in benefits. McCarthy also held up the cleanup of brownfields – polluted urban lots that are often former factory or industrial sites – as another way that government anti-pollution action has benefited the economy. Since 1995, government-sponsored brownfield cleanups have returned 41,500 acres to development, generating 93,000 jobs and leveraging $20.8 billion in economic development, she said. Each dollar spent on the EPA’s brownfield cleanup program, McCarthy said, leads to between $17 and $18 in public and private funds for cleanup and development. McCarthy delivered her comments before 300 people gathered at Wasserstein Hall. Harvard Law School Dean Martha Minow introduced the talk, billed as McCarthy’s first public policy speech since she was confirmed. The session was hosted by the Law School’s Environmental Law Program. The event had something of a homecoming feel, as McCarthy, who was raised in Boston, was introduced by her daughter, Maggie McCarey. 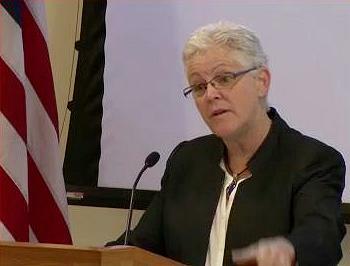 The new EPA chief previously worked as an environmental administrator for several Massachusetts governors, including Mitt Romney, and also served as commissioner of the Connecticut Department of Environmental Protection before moving to the EPA as an assistant administrator in 2009. McCarthy’s confirmation process became a lightning rod for Republican disapproval of the Obama administration’s decision to pursue climate-change action through regulatory rather than legislative means. Under that strategy, the EPA can regulate carbon dioxide as it does other pollutants and move ahead with some actions without approval from Congress. McCarthy was subjected to intense questioning by Republican senators, and was called back to the Senate 70 times over a 136-day confirmation period during which she answered more than 1,000 questions. House Republicans have expressed their own disapproval of the agency’s activities, proposing cutting the EPA budget by a third. Though much of the spotlight has been on the federal government, McCarthy said that it rarely leads in promulgating regulations. Instead, she said, it embraces effective examples set by an array of state and local governments, nonprofits, universities, businesses, and individuals. In response to a question on the controversial proposed Keystone XL tar sands oil pipeline from Canada, McCarthy described her role as that of a mediator who tries to get all sides to work out their differences. “It’s not supposed to be easy; it’s supposed to be hard,” she said. McCarthy cited the devastating impact of Superstorm Sandy as an example of how environmental issues are at their core economic ones. McCarthy said the agency is committed to working in partnership with diverse groups to clean up the U.S. energy system in a way that not only lowers emissions from climate-changing greenhouse gases, but that also stimulates the economy.